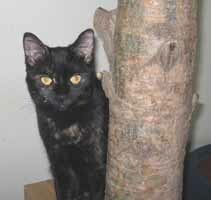 I just wanted to update you on the little Tortoiseshell, Mocha, I adopted from you at the end of March. I renamed her Kizzy and she is a wonderful addition to my home. She gets along beautifully with my other cat, Doxie. 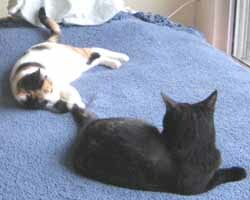 The two of them have become good friends and are always playing and grooming each other. Kizzy did not have much of a meow when I first adopted her, it was more like a tiny squeak, but now she is developing a stronger meow. 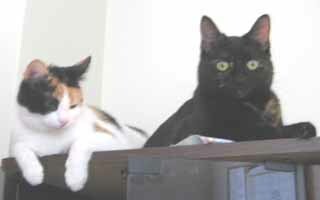 She and Doxie enjoy "talking" to me when I'm in my kitchen cooking, and both cuddle up together next to me at night. Kizzy is always the first to greet any of my guests and will decide if the person is worthy of being scented. She seems to communicate with Doxie to let her know when its ok to approach a person or not. Kizzy seems to be helping Doxie out of her shyness. They are a wonderful combination. 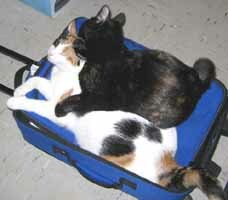 You would never know that these two sweet girls were not litter mates! Thanks for allowing me to bring Kizzy into my life, her outgoing and spunky kittenness is always wonderful.